Home Europe V4 Report: Merkel surrenders as Schulz and the Socialists pull a virtual coup. V4 Report: Gone are the days of “selfies” and Angela Merkel’s proclamations of “We Can Do It.” How things have changed in Germany during the last 30 months. The CDU surrenders as Martin Schulz and the Socialists pull a virtual coup. Horst Seehofer, leader of the CSU “sister” Party, was happy for any deal, regardless of the costs, that would keep him in power. Seehofer said the 177-page agreement reached with far-left socialists was well suited to “overcoming the divisions and polarization in our country” and he viewed the deal as extremely positive. Of course he did; Seehofer will become the next Interior Minister. 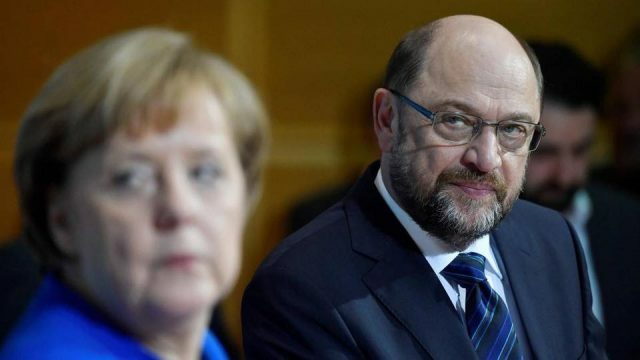 The biggest losers in the elections, Martin Schulz and the SPD, end up as the winners in Germany’s coalition talks, which is a sign of just how far Merkel has fallen. Amazingly, Schulz will become Foreign Minister, a post considered the second most prestigious in Germany. This comes at a time when Schultz’s personal approval ratings have dropped dramatically after German voters rejected his extreme message. Merkel has to see the writing on the wall. According to Christian Caryl, gone are the days when Merkel could shape the German political landscape as she wanted. Even if she retains her seat as chancellor, the end of her era is already in sight. Germany has moved to the left as Martin Schulz and socialists beat-down Merkel and the CDU. According to Caryl, Merkel emerged from the latest coalition negotiations as a dramatically diminished figure. She has been forced to pay an extremely high price to her negotiating partners in the left Social Democratic Party (SPD), and the rank-and-file among her own Christian Democrats (CDU) are unlikely to forget it anytime soon. Will its new government be capable of formulating a coherent and realistic immigration policy that can undermine the AFD’s appeal? If the current coalition agreement is anything to go by, the answer is no. It apparently caps the number of migrants who may enter the country each year at 220,000 — an amount hardly likely to reassure German voters who are concerned about the effects of mass migration. Germans see the numbers; at least 1,000,000 new migrants every five years. Good luck. Schulz may know how to negotiate but Old Seehofer does not. The CSU must be embarrassed over this deal. However, migration is only one of several areas in which Merkel’s weakened position forced her to cede ground to the Social Democrats. Merkel stunningly also ceded the powerful finance ministry to the SPD. The last Minister of Finance, Wolfgang Schauble, understood markets, economics and reality. The SPD does not and this will have repercussions across Europe, especially in Central Europe. “I think the cabinet formation, as it is now, is a political mistake,” said Christian von Stetten, a CDU lawmaker who represents business interests, told broadcaster ARD, adding that this applied in particular to giving up the finance portfolio. The game has certainly changed in Europe. The Eurocrat’s dream of a Europe dominated by Paris and Berlin is over. If Merkel is weakened, this will certainly negate the influence of Brussels as more nation states will begin to challenge Berlin and the severely wounded Chancellor. Emmanuel Macron and Martin Schulz are federalist allies and will definitely attempt to expand the scope and power of the EU, but they simply do not command the respect of Europe to accomplish this. The rest of Europe is moving away from the “Social Democrat” model and even German voters repudiated it. This is a very odd situation in Germany, where three leaders of the political establishment seem to be desperately trying to hold onto power at any cost. This may not only be the beginning of the end for Merkel, but for the Grand Coalition itself. Every dynasty eventually falls. Let’s hope it’s sooner rather than later.